what do you mean by x10? 10:1 on sensor or linear eye magnification? 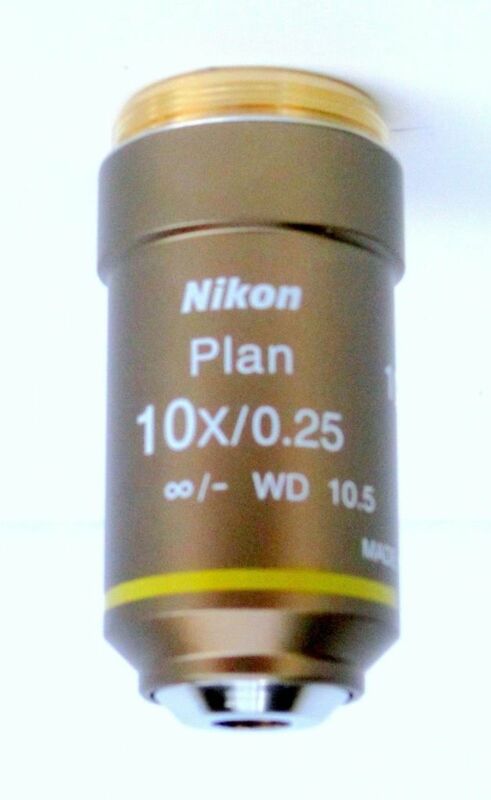 10X on sensor if requirements of the objective have been applied (tube length for 'finite' objectives or focal length of tube lens assembly for infinity-corrected objectives). do you know what is the relation of magnification on sensor and eye linear magnification? Sensor size does not change the magnification. "10X on sensor" always means that the image on sensor is 10 times larger than the real subject. In a microscope, the eye linear magnification is calculated as objective magnification multiplied by eyepiece magnification. The typical eyepiece magnification is 10X with roughly 20 mm diameter field, so imaging with a 10X objective on APS-C gives you about the same image that you would see by eye at 100X. I cannot recall ever seeing a test report for that objective. I can find a few references at photomacrography.net using Google search, but none of them are accompanied by images or comparisons to other objectives. 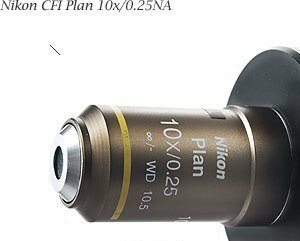 Based on its placement within the Nikon line, I would expect it to behave optically very similar to the CFI BE MRN70100. OFN20 refers to the "field number", which is just the diameter in mm of the eyepiece field for which the objective is designed. However, modern Nikon objectives typically deliver good image quality over a much larger circle than they are specified for. Based on the MRL70100, I would expect the MRP70100 to cover APS/C with no problem at all (28 mm diagonal). Iit might well cover full frame with pretty good corners also (43 mm diagonal). The MRP70100 is part of Nikon's CFI60 series [REF]. 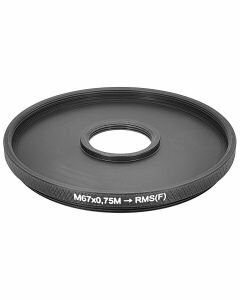 This means that it has 25mm threads and a "parfocal" distance of 60 mm from the shoulder of the mounting threads to the in-focus subject. Is this the same one as in page 1. Thank you very much. Merry Christmas guys. Yes, and this is a fair price for this type of objective purchased new. A discussion of "Raynox DCR-150 tube assembly with flocking" can be read at http://www.photomacrography.net/forum/viewtopic.php?t=35350 . I don't think that the EF-S 18-135 lens would make a good tube lens. Do you already own it the Canon lens? If not, don't buy it. I have one at hand, could test it for you upon your request. I would like to mount it on the sigma to see if it works. What exactly are the adapters required- that's where I'm stuck. Many thanks for your help! Thanks a lot Pau for replying, meantime I read the same thread and figured it out about adapters. 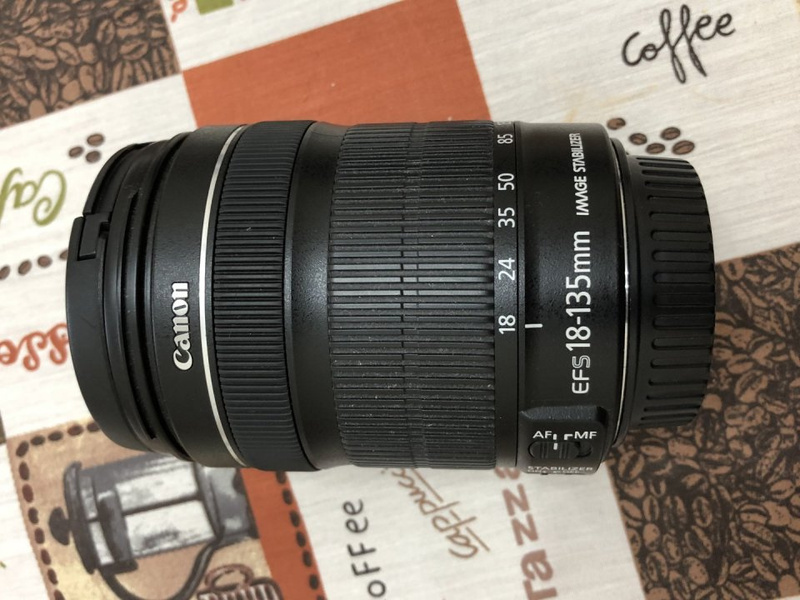 As for the tube lens, what lens should I use? A prime 200mm? If I use a zoom lens (i'd like this for varying the magnification) would the image IQ decrease? I run into this: https://www.thorlabs.com/thorproduct.cfm?partnumber=ITL200 but I don't quite afford spending another 500$. People are getting excellent results with old manual 200 and 135mm prime lenses.